After spending just a couple of months as a member of a local swim club, 13-year-old Michelle Ballasiotes realized that she wasn't cut out for its rigorous practices and competitions. With the lifelong effects of a mild form of cerebral palsy, Ballasiotes will likely never have the physical coordination to be competitive on the same level as many other swimmers. So the recent formation of the Paralympic Sport Metrolina's swim club was perfect timing for Ballasiotes. 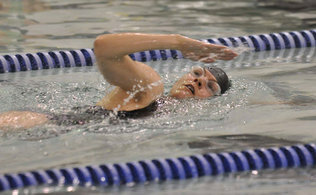 Geared toward inclusion, swim-stroke development and the possibility of competing at participants' own levels, the swim club operates through the Mecklenburg County Park and Recreation Department's Therapeutic Recreation section at the Marion Diehl Recreation Center pool on Tyvola Road. The club just completed an introductory five-day mini-session on Dec. 15 and will begin its full program on Jan. 5. For eight weeks, the club will meet from 7 to 8 p.m. Wednesdays and 8 to 9 a.m. Saturdays. Park and Recreation established Paralympic Sport Metrolina last spring through its partnership with U.S. Paralympics, the national sanctioning body that provides sports opportunities for youth and adults with physical and visual disabilities. Paralympic Sport Metrolina is one of only two U.S. Paralympic sports clubs in North Carolina, according to the national organization's website. After hosting sled hockey clinics in the spring and fall, the swim club is Paralympic Sport Metrolina's first full-fledged program. Having spoken on Capitol Hill several times on the effects of prenatal strokes, the cause of her right side hemiplegia (a mild form of cerebral palsy), Ballasiotes is well aware of what her disability prevents her from doing. What she won't accept is a lack of opportunities because of it. Ballasiotes has participated in mainstream sports - soccer and softball when her family lived in Chicago - and adaptive athletic programs (swimming in Augusta, Ga.). Just when she started to enjoy the swimming, her family moved to Charlotte. "I would swim every day if I could," said Ballasiotes. "(Paralympic Sport Metrolina) is just a good fit because they understand disabilities, so I'm at the right level." Therapeutic Recreation Specialist Jana McMullen directs the club, modifying instruction to suit each individual's needs. For example, McMullen teaches Ballasiotes to use hand-held weights and paddles and a pool buoy to work specific muscles. In the club, Ballasiotes has found a mentor in Cadie Jessup (pictured), a 34-year-old amputee who lost part of her left leg to a blood clot just over a year ago. Formerly involved in recreational soccer, golf and flag football, Jessup is seeking out athletics that can keep her active. Jessup's main purpose for joining the swim club, though, is to encourage others to participate. "Leg loss is not life loss," said Jessup. "... I love swimming. I now have able-bodied friends swimming. It's wonderful for people with disabilities. You feel refreshed, and you have muscle tone from doing it." Jessup recruited Cason Bolton, 46, into the swim club. Bolton is a peer visitor at area hospitals and counsels fellow amputees during some of their difficult times. That's how he and Jessup met last year. Now Jessup also serves as a hospital peer visitor. While Jessup and Bolton embrace being role models and enjoy the social aspect of the program, Ballasiotes looks forward to the possibility of the club hosting its own swim meet one day. With only a handful of members, a swim meet is probably far off. But if enough people can follow the example of Ballasiotes, Jessup and Bolton, the Marion Diehl Center pool will be full of more than just water.